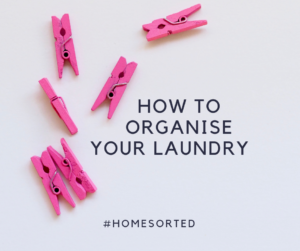 How to Organise Your Laundry - Home Sorted! When is the last time you organised your laundry? For most people, the laundry falls right at the bottom of their home organisation to do list. But it shouldn’t. We’re here to show you how quick and easy it can be to organise your laundry. And how good it can be for your home overall. Here at Home Sorted! we always recommend using a minimum of two washing baskets – one for whites and one for colours. This allows you to fast track the time it takes to do the laundry as your soiled clothes are already sorted for you. If you’re extra keen you can use separate baskets for handwashing and intimates also, but this is 100% a personal choice. How many times have you gone to put the washing on, only to realise that you’re fresh out of washing powder? Too many? We recommend storing washing powder in glass jars to ensure this never happens again. Not only do the jars look great (especially if you have open shelving) but they allow you to keep track of how much washing powder you have left. You can use the same approach for liquid detergents and softeners, except in this case we recommend glass bottles. Use vertical storage for everything! Do you have an ironing board taking up space in your laundry? Maybe it’s a lovely collection of brooms and mops? Either way, a great way to get on top of this clutter is by using vertical storage. Simply install some small hooks onto the walls of your laundry and you’re good to go. Not only does this free up space, but it prevents small people from accidently knocking over items when passing through the laundry. One of the biggest complaints we hear is that the laundry is out of control with washing! Combat this by getting into a washing schedule that sees you do a load every single day – at a minimum every two days. Not only does this ensure that your laundry doesn’t smell – soiled clothing does this sadly – but it keeps your washing and ironing loads at a manageable level. Simply pop a load on each morning when you get up and hang out after breakfast. You can also opt to do this of an evening before and after dinner.